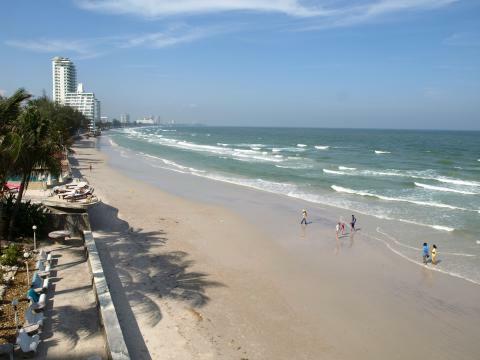 Hua Hin is one of the most well-known seaside towns lying on the west side of the Gulf of Thailand. It is noted for its traditional fishing port, splendid sandy beach, exciting water sports, golf, seafood restaurants, and Thai arts & handicraft. You may enjoy walking through the quiet windy streets of a friendly coastal village or sample the fresh seafood in any restaurant overlooking the sea. Hua Hin is definitely an amazing place not to be missed! Hua Hin Beach white sandy beaches stretches along the Cha Am Coast and North of Hua Hin. Its white sandy beaches and beautiful scenery will fascinate anyone who is a beach lover. Activities such as jogging, sun bathing, horse riding, kite boarding and other kinds of water sports are available here. The Hua hin area including Cha Am has extensive beachfront with the added benefit of no roads to cross to access the beach. Beaches stretch along the Cha Am Coast and North of Hua Hin and also directly close to the town and continue south past popular beach resorts to Khao Takaib beach. Hua Hin is closely associated with the Thai royalty. Merely 25 kilometers apart, Hua Hin in Prachuap Khiri Khan province. Khao Takiab Beach (closest to central Hua Hin) isn’t the most visually stunning by Thai standards, but it does have a relaxed ambience and it’s an area I’ve personally always enjoyed visiting. There are some great local restaurants close at hand and there is easy access to the 19 metre high Standing Buddha (Phra Pang Haan Yad) which looks out onto the sea. A short walk up the hill brings you to a shaded sala area where you can get a cold drink or a a traditional massage and enjoy the view. From here, a staircase leads further up the hill to a temple (Wat Khao Takiab), but if you are planning on venturing up there beware of the monkeys who will sometimes grab hold of bags and personal belongings as they look for food. Khao Takiab Beach is best reached by doubling back to the main road and following it south. You will soon see a number of hotels set back from the beach which offer budget and mid-priced accommodation. Pathways and side-roads lead through from the main Takiab Road to the beach. This stretch of sand extends south to Haad Suan Sod (Sea Pine Garden Beach) which is a favourite for locals and Thai tourists who enjoy the shade offered by the pine trees and causarinas. Khao Takiab Beach is a very popular beach just 15 minutes south of the center of Hua hin Town. Around Khao Takiab you will find luxury resorts such as the Hyatt Regency Hua Hin and also fine resorts such as Kaban Tamor, S'Mor Spa, Supatra resort plus other accommodation, Hua Hin Spas - La Mer Seafood restaurant at Khao Takiab and Rua Rimtarn Restaurant at Khao Takiab, also many new restaurants in Hua Hin close to Khao Takiab Beach. Bluewave beach Hotel at Khao Takiab Takiab beach Hotel, many people think Khao Takiab is the best beach in Hua hin, a long stretch of beach that is relatively quiet but also has some nice restaurants, beach cafes, a fresh cool breeze and views of the offshore islands including Koh Singto island which is popular for fishing in Hua Hin. Khao Takiab Beach is now becoming very popular offering quiet relaxation plus amazing view of Temple Mountain and the offshore Islands including Koh Singto / Koh Sintao Island which is popular for boat trips and fishing. The area offers some fine resort accommodation and budget hotels. 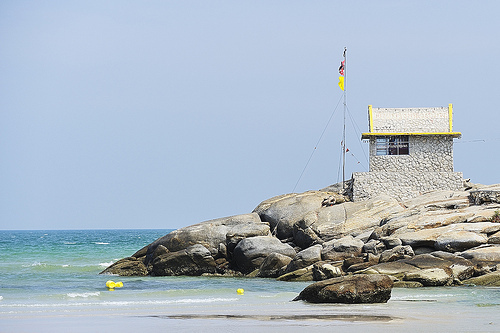 Khao Takiab is just 5 kms ( 3 miles ) south of Hua hin Town Centre. At Khao Takiab Beach you will find a lovely Palm Tree setting near the beach with local Thai food and drinks, it is next to the small fishing village of Khao Takiab where you can relax and watch the local fishing boats travel to and from the little harbor.